Has anyone researched the history of their T? Traced the VIN or other records? Found anything in your car..paperwork ect.? I realize that after 80 to 100 years...its almost impossible unless you bought the car from a family that's owned it most of it's life. Mine was acquired in the late 50s by my father. My Gramps bought this new in 1924 at Wm. O. McKay Ford Dealership in Seattle - drove it up until 1958. My '18 TT was "equipment" included with a ranch purchased by my grandfather in 1946. I know nothing of it's history prior to that date and everything after that date. I can only trace this one back to the mid 60s when I bought it as a Roadster. I traded the body for a touring which I used until the 90s when I turned it into a Tudor. The engine and chassis are from the same car except I installed a '27 rear axle for brake safety. The motor number is a 1925. For me, that's been a hard nut to crack. -The previous owner of my Flivver bought it at an estate auction; it being represented as having been restored ten years previously. -Were we talking about a rare car like a 1911 model-year, there would probably be a conspicuous paper trail, but my car is a very common, vanilla-flavored '15 Touring. -Ford's records for that model-year were destroyed by fire, so there will be no info there. Now, I suppose just about anything could be tracked to its roots if one were willing to invest in a private investigator, but on my part, that kind of behavior would be way across the line bordering Crazytown. But maybe I'll phone Hagerty Insurance and see whether they know of a way to track this kind of info either online or by some other reasonable means. -They're usually very enthusiastic about helping their clients with this sort of thing. I bought mine from an iffy biker guy with a real thing for German history from '33 to '45. I know my truck has history, but I don't want to know exactly what it is. Even if your state allowed back searches, many records have been purged. The very early cars there might be factory records but for the most part, word of mouth or last name on title before you got it if they are alive. The wife's 1923 Runabout was purchased new in Enumclaw WA by a Dr who used it to see his patients. Prior to our purchase it had 6 previous owners who's names we have. The car never left Enumclaw (ownership) until we purchased it and moved it to Kapowsin WA, about 15 miles from Enumclaw. 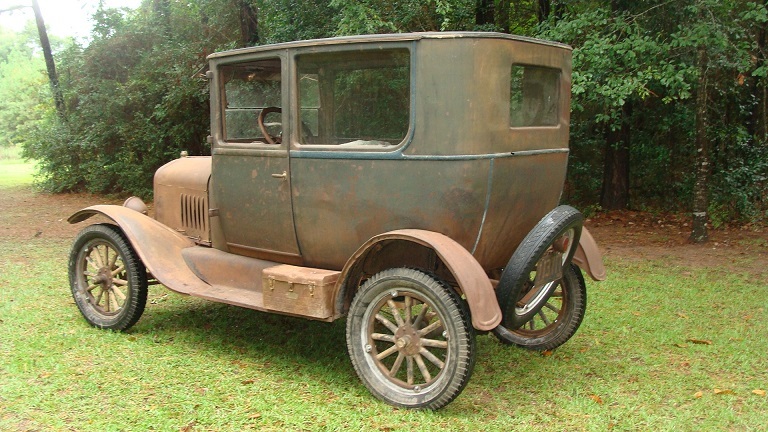 I would like to know the history of my 1926 coupe further back than the old man I bought it from in 1970, listed on the title, who, after 48 years, is no doubt dead. I know who/where mine was registered to in 1953, but that's about it. J. Meixner of Owatonna, MN. The previous owner bought it in Owatonna, and took it to his home in Austin, MN. I bought it there and brought it home to Mantorville, MN. Assuming it was a local car in 1953, the car hasn't gone very far. Our 14 was bought new by my wife's granddad. Supposedly my T spent a significant portion of it's life on two private islands connected by a private bridge off the coast of Massachusetts. The words Nonnammessett Point is painted in gold leaf on both front doors. The only Nonnammesssett Point that I could find is (logically) on Nonnammessett Island, connected by the bridge to Naushon Island. The two Islands have less then five miles on unpaved road total. I would post a photo but I don't know how to resize it to fit this forum. If you don't already know the car's history, you probably never will. As Mark says, many states don't keep records back more than a few years. How right you are Steve! However, I always wonder where my car came from. I do know it was from California and the guy most likely retired to Arizona where I purchased it. Other than that have no clue! My car a 1925 coupe had one owner, a local farmer who drove the car as his only transportation. My dad tried to buy the car from him, for several years, but he would not sell. One day, in 1960 he called my dad and said the car was for sale, but the engine had a terrible knock in it. He had tried to remove some shims from the bearings, and got them mixed up, and it was worse than when he started. Dad bought the car, put a 1915 engine in it, and it was driven one day in a local parade. Dad had to work the day of the parade, and so he didn't even get to drive it. My uncle drove it, and I rode in the car at 10 years of age. 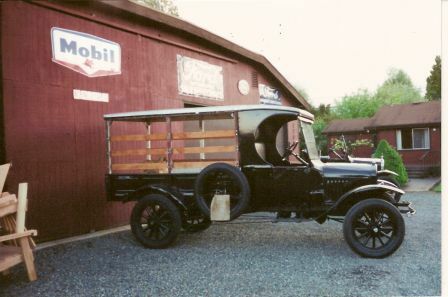 The day after the parade, dad bought a farm, and in the hurry to get a wife and six kids moved to the farm, he never took the time to drive the Model T.
The day to move the Model T to the farm it would not start, so they pulled it with a piece of rope, and parked it in a shed. It sat there from 1960 until 2005. Dad was always going to get it out, but things kept getting in the way. I asked him in 2005 if I could help him restore it, and he said he had kind of lost interest in it, but I could have it if I wanted. The real story, was he had Parkinson's Disease, and really couldn't do it. I brought the car in, spent 2 years, with a full blown, every nut and bolt, restoration, back to original. Not a difficult task, because it was an unmolested, 100% original car to start with, no rust, etc. 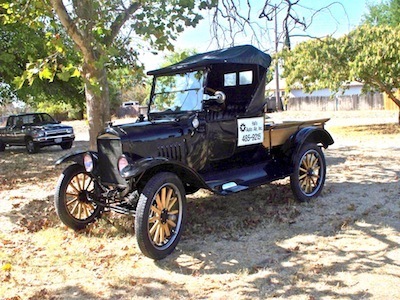 In 2007, that parade that dad wanted to drive his Model T in, but couldn't because of work, well now, Parkinson's prevented him from driving the car again. But he rode with me driving this time. And we rode in that parade for the next 3 years. It took 4 people to get him in the coupe the last year, the Parkinson's was so bad, but he enjoyed every minute. 2011 was the next year, and he was really bad, and I had no idea how I was going to get him in the car again, but he died 2 weeks before the parade. I guess that solved the problem. 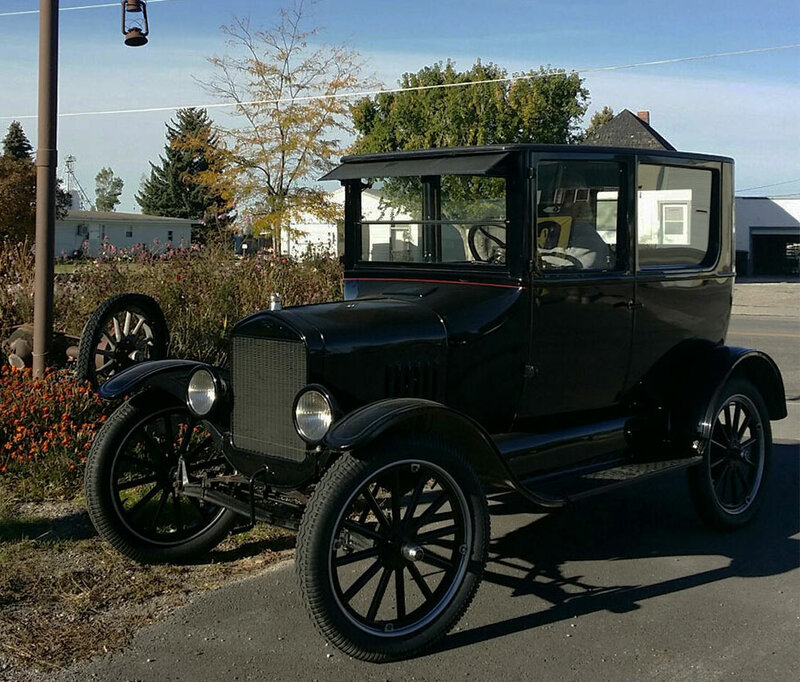 The day of his funeral, I drove the Model T behind the hearse to the graveyard. That was the best I could do for him. 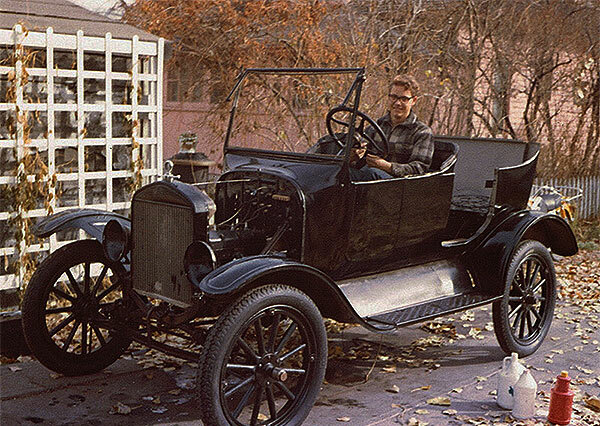 After all those years, dad's dream was to own a Model T. He owned one, but never got to drive it. I drive it all the time. We have done many tours. I am sure dad had no idea that his Model T would travel all over this country, and offer so much fun for me and the people we meet. I still call it "Dad's Car". It will never truly be mine, I just get to take care of it, until I can pass it on to someone else, who I hope will enjoy it as much as I have. My 27 Canadian Touring car was purchased by my Dad in the early 60's from the original owner. When we hauled it out of the woodshed it had 1947 plates on it. My Dad and I had it painted, upholstered and motor overhauled. Since then it has been in the family and driven by myself, my son and my grandson. I have a 1944 registration which shows the guy we bought it from plus his brother as owners. Apparently, whoever's name was on the registration was entitled to drive without buying a drivers license. Who knew? Car still has original vaporizer. I removed the accessory water pump and foot gas feed several years ago. Great car that will stay in our family. I have the original 1919 registration along with a few others for my T.
My 1926 was bought new by my Grandmother at the local Ford Dealership. She ordered a Ute ( Pickup) however the Dealership obviously cut down a Tourer to satisfy her order. 1926, family owned until I bought it. Dealership sales receipt and documented up grades in the early 60's of a Rajo and ruckstell. I found this ... "https://www.thehenryford.org/collections-and-research/digital-resources/popular- topics/production-records"
For the Model Ts serial number 1,119 Mar 1909 to 70,702 end of Sep / beginning of Oct 1911 the shipping documents are available for most of the USA produced cars. Usually it has the city it was shipped to. Sometimes the dealer it was shipped to. And occasionally the person it was shipped to. After early Oct 1911 they do not have the microfilm for the shipping documents. For the early Oct 1911 to very early 1915 the Ford Account Receivable Ledgers contain about 22 percent or so of the serial numbers for the USA cars (and USA engines shipped to Canada) that were produced. They often share the City and state they were shipped to. But they are listed by the dealer (then called agency) so you cannot just look at the serial numbers before your serial number and find your car. Some of the states have license plate information that collectors have. So "IF" you have a photo of the car from that state with the original license tag visible, they can look it up and let you know who it was registered to at that time. And of course you can do a search through the club magazines. The digital versions allow you to search quickly to see if the serial number was mentioned in an advertisement (that is rare) or in an Article about the car (often the engine serial number is mentioned). And if the person was active in a local club -- and you know the car was from the area the club was, you can ask some of the folks from there. On a more expensive route, https://en.wikipedia.org/wiki/R.L._Polk_%26_Company used to have a wealth of data on the early cars. 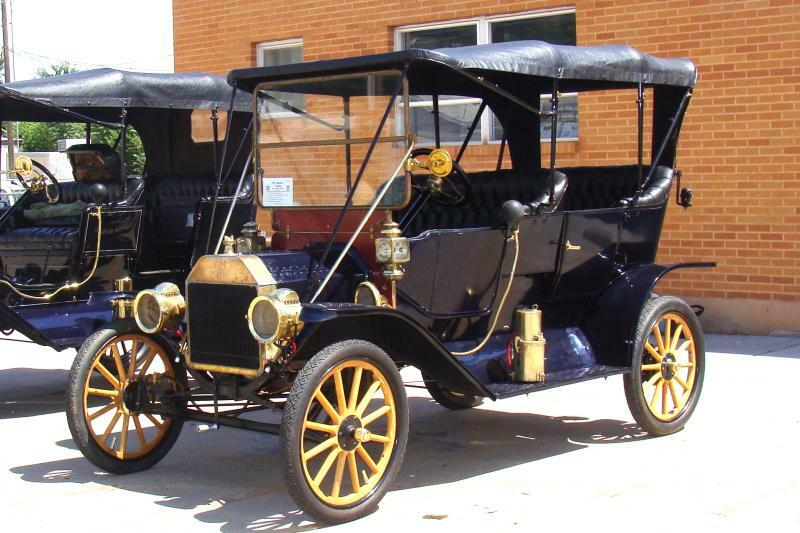 For example on page 8 of "Tin Lizzie" by Stern it states: " In 1948, when R. L. Polk and Company made a survey of registered Model T passenger cars in the 48 states, they found only 49,869 Model T's left." But they are a business and not a hobby -- so I don't know if they kept the old data and if they did -- what they would charge to run a search for you engine serial number. And of course the engine could have been changed out sometime in the past. But as I often mention to folks -- you won't know if you can find it or not unless you try. And I've seen a few cases where it paid off for the person who wanted to do the searching. 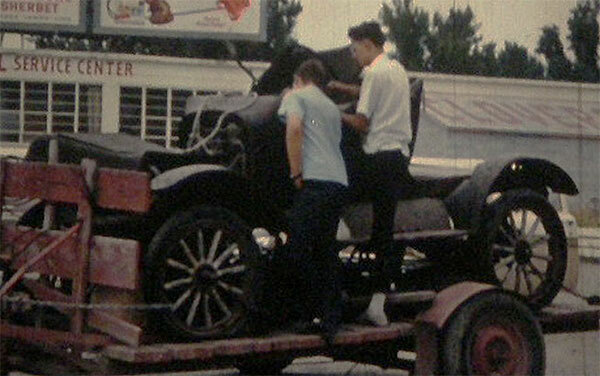 The history on the cars I got from my Dad go back to 1946 - 1950. 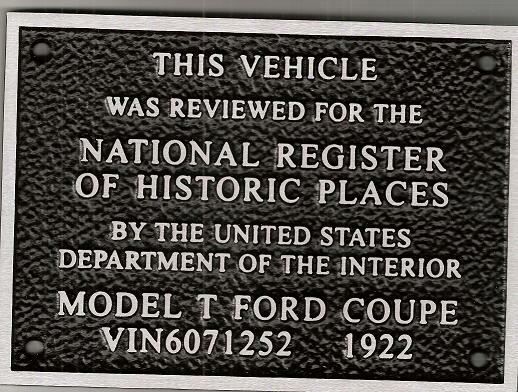 And my 1931 Model A Ford came with the registration with the original owner's name as well as when it was sold. But in general after Sep 1911 there will not be much of a paper trail (actually microfiche) on a T. And for the Oct 1911 to after Jan 1915 there is a limited paper trail (they have the actual ledgers for about 22 % of the dealers that Ford shipped the T's to). 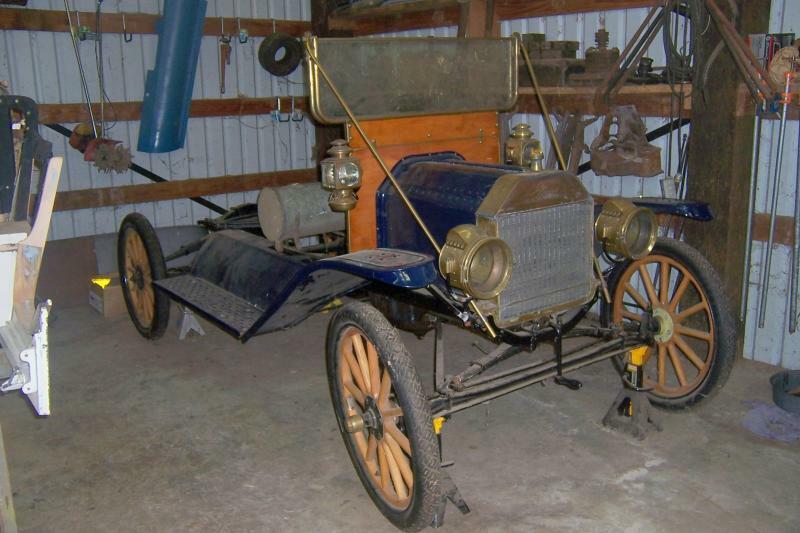 And for Jan 1915 or later a Model T will not have much of a paper trail at the Benson Ford Archives. All I can say at this point, is my 1913 touring has been owned by me longer than the original owner! I last drove it today. I have my grandfathers 25 coupe. He bought this car in late 1941 or very early 42, after the war had started. He had looked at it before the war, but thought it was too high priced. When he went back, it was higher yet, but he bought it anyway. He was a farmer outside of Crouthersville, In. The only car he would ever drive was a T. I have been in and around it all my life. My dad flat towed it from Indiana to Utica, NY in 1959, behind a 58 Plymouth, and it was driven regularly in the sixties, as our second car. It was mostly unused in the late sixties and early seventies, when the five of us children were in college, getting married and getting on with our lives. The car then was towed to my brothers home in Virginia where he and his family enjoyed it again.in the late eighties, or early ninties, he was transferred to the Dayton Ohio area, and the T came with him on a small trailer, towed by a v-6 Buick Apollo! In 2001, he took a job in New Hampshire, and didn't have a place to take it to, so it came back to Indiana with me, about seventy miles from where it had left in 1959! I drove it a lot to start out, including one day when we drove it 120 miles. My dad reminded me that all of the tires were at least fifty years old, and a couple over sixty! It soon had four new tires on the ground! Right after that, in fact on its first trip on them, it suffered a pinion bearing and pinion gear failure that almost caused a bad wreck. It started free wheeling down a hill towards a crowded parking lot by a river and water fall in a local state park! The emergency brakes hadn't worked much for sixty years, and were of little help either. Finally the drive shaft rotated to where it caught, and we slid to a stop! I handed the wife a wheel chock to place in front of the rear wheel and we waited for the wrecker. It was not thrust washer problems, they were replaced with brass in the fifties or early sixties. The pinion roller bearing disintegrated, and took two teeth off the gear, and damaged the ring gear as well. It now has a modern bearing system, modern seals, lined brake shoes with bushings and cams replaced so the emergency brakes are working again. I've also done the exhaust including the manifold, a replacement Arvin heater, and all the rest of the exhaust, and electrical wiring under the dash and hood replaced. Life got in the way for the last ten years, but now that I have the hack done, I can think about the coupe! Mine all came out of Detroit Michigan. That is as far as I can trace them! I have owned Henrietta for just a year. I bought her from a lady who was winding up her Dad's estate. When I picked her up at the storage facility, I was given the 1955 registration certificate, the waterslide decal that goes on the windscreen to show that the car is registered, and an accompanying letter from the local stock agents to say that they had paid the registration fee out of their farm account! Prior to the storage facility, the car had been kept at the suburban retirement house when my contact's father had retired from the farm some 20 years earlier. His mother is the registered owner on the 1955 certificate. There is a chance I am just the second registered owner. In the 1920's a monthly motoring magazine used to list all newly registered cars by rego number, make and owner. The state motoring organisation had a collection of these which I last looked at around 1995. I am hoping they still have them. Armed with the original rego number, I should be able to ascertain whether the Webb family, from whom I purchased the car, were the original owners, confirming that I am the second registered owner. 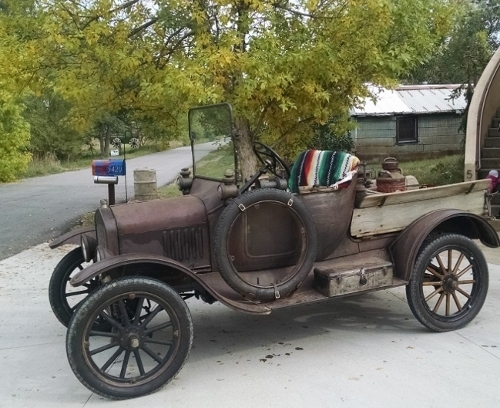 My 1919 Touring was originally owned by a Farmer in the Upper Penensula of Michigan and he used it like a pick up truck until the 1940�s to haul firewood though the forested part of his farm. It arrived here in Texas with a home made trailer hitch bolted to the rear springs and every single part of the front end was pounded out and needed replacement. I was told the Touring was constantly driven though ravines and deep mud during it�s initial tour of duty. One could tell he planned on keeping it for a long time because he �modernized� it at one point by adding 21� split rim demountables and a vaporizer Carburetor. My information comes from one of his family members and a short local newspaper article from the 1940�s. 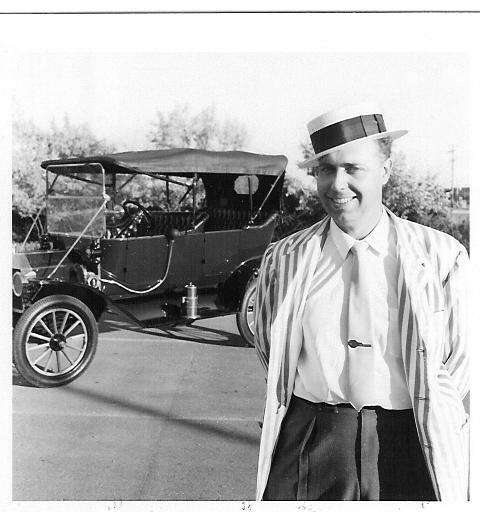 In 1941 Joseph Solstrom Jr. who was 10 years old at the time, bought a 1923 Runabout for $5. He hid it at a friends house until his dad found out about it and when he did he gave him a whipping and a lecture, telling him that someday he would outgrow this sort of nonsense. 70 years later, when Joe crossed over the river, he still owned his $5 car, along with several other Model T�s, so his dad wasn�t even close. I bought the car from the estate 3 years ago and while I paid somewhat more for it than Joe did, I have throughly enjoyed it. One of my sons, who has a 1930 Model A Coupe that he has restored, has spoken for Betsy after I cross over the river so the car will remain in our family for the foreseeable future and will receive the same care that Joe gave it. 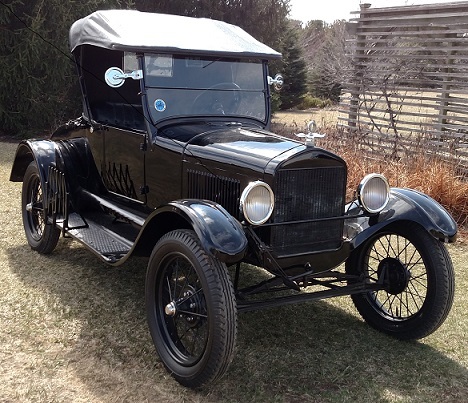 I was told my 14 came from a barn by Detroit in about 1960 and it was freshened up at that time.One thing i did notice was it has a hole in the rear seat metal riser to hold a battery hold down.The 1914 pattern car also has the same hole which i know did not come from Ford,but it must have been handy at the time? Bud. Larry S. said his T "has been owned by me longer than the original owner". My Yellow Speedster has been that for 52 years. FWIW. I point that out when folks comment on it's lack of antiquity when they are showing their restored 70s and 80s cars. I bought the complete chassis from my best friend Rich Bingham in about 1966. He had put the Roadster body from my '25 on it. Later he built a depot Hack body for it. We had great fun with it and used it in a homemade movie. We adapted rear seats for the kids at one point but now have returned to a 2-seater. The last photo shows it's first body without the striping. Pretty plain. I have my grandfather's 1915 which he bought new. He had it stolen but was later found and took him four days to bring it back home. It has been on the Natchez Trace and at Henry Ford's estate in Savannah, GA. 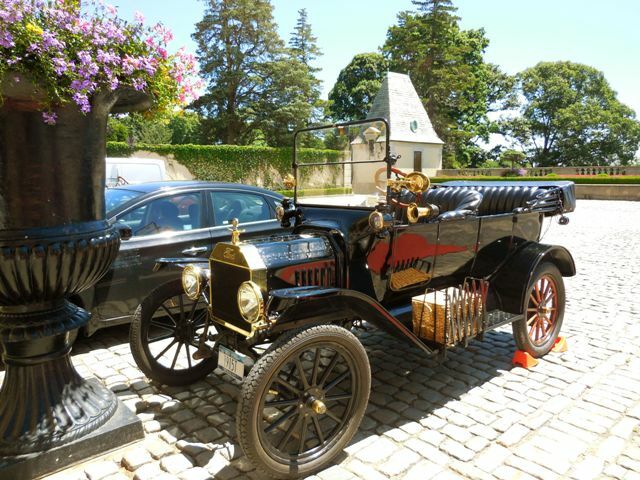 It was also shown at the Hilton Head Concurs along with Fatty Arbuckles fabulous 1919 Pierce where it received the AACA Century award while participating on the Glidden Tour. Mine came from a local family and was made in Denver. (in progress photo from last year). On December 31, 1911 Elhanan R. Parkes, 59, bought my touring car from Dahlen Ford of Walla Walla, Washington. He drove the car for the next 24 years. One trip in 1935 took him to Gold Hill, Oregon. On this trip, Mr. Parkes passed away at the age of 82. 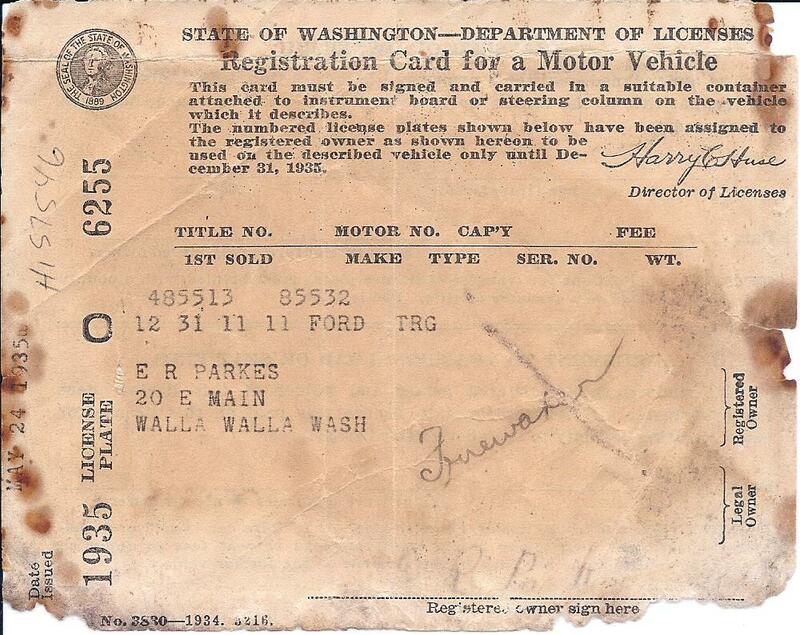 I have the Washington State Registration from 1935. His great nephew, Marshall Hamm bought the car from the estate for $20 and went to Gold Hill to take it to his home in Lyle, Washington. Marshall Hamm sold the car around 1955 to Bill Kubeck and John Kallstrom who were from the greater Portland, Oregon area. Note the 1935 license plate still on the car. Bill Kubeck and John Kallstrom sold the car to Jerry Battin in 1978. Jerry Battin Sold the car to David Aschbacher of Oregon City, Oregon in 1986. 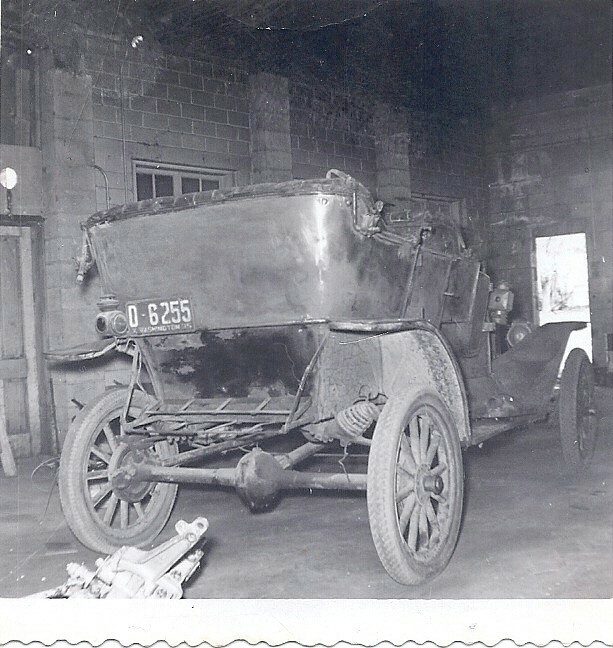 At this time, Aschbacher visited with Marshall Ham and learned the early history of the car, and acquired some photos. In 1995, Aschbacher sold the car to Ted Van Beek, of Clatskanie, Oregon. In 2001, Ted Van Beek sold the car to Olaf (Ollie - with a long o) Rove, of Gresham, Oregon. I bought the car from him in 2008. 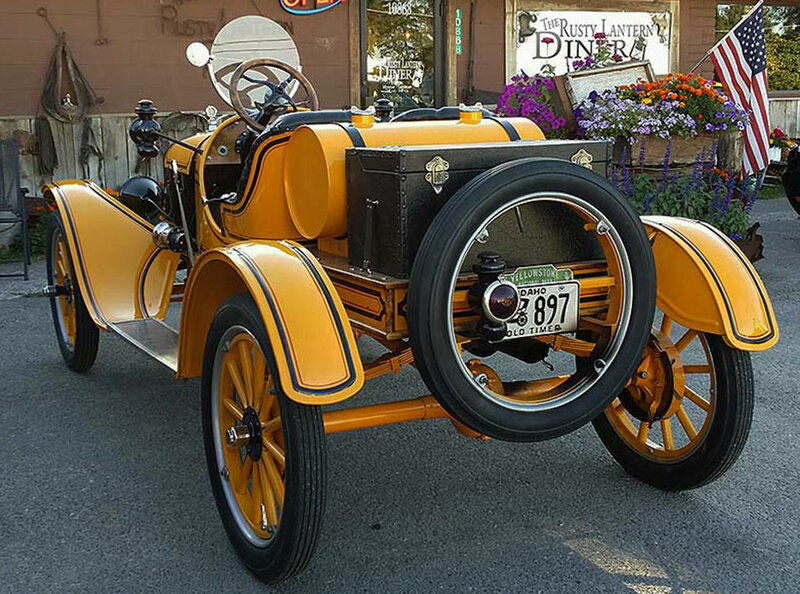 By July 2013 the car was restored enough to take it to Kanab, Utah for the Canyonland Tour. It is known that automobile enthusiast and writer, Floyd Clymer sold cars for Dahlen Ford in Walla Walla, Washington in 1911. Records show that in 1911 Dahlen Ford sold 41 cars, but I cannot verify that he sold my car. 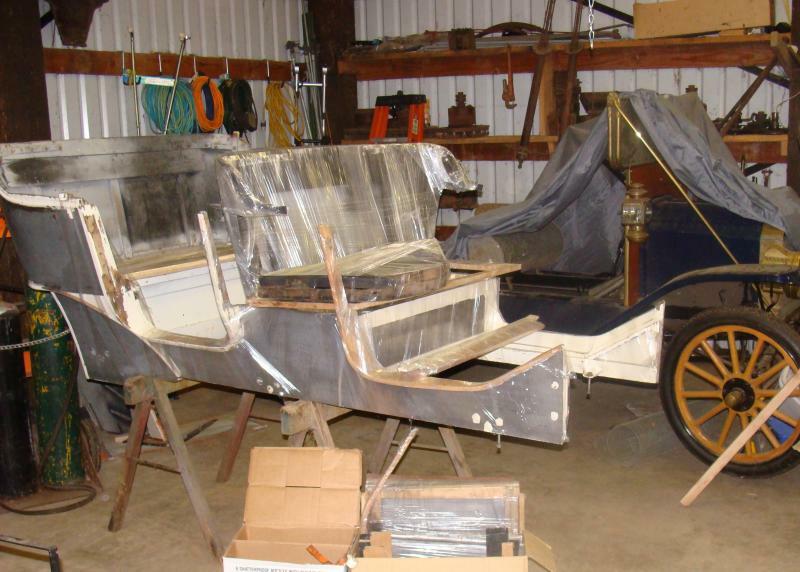 Sometimes researching the history of a car is as much fun as restoring the car itself! Wow! What great photos and stories. I would love to have an original T with a great history. I have assembled some of my Ts much like the plastic models I built as an teenager, mixing parts to make what I wanted. 1. As the automobile was a thing of wonder in the early years, local news papers often carried accounts of local events such as the sale of property or even the sale of a new car. Check for any newspapers that covered the Walla Walla region during the time period of 1911. 2. 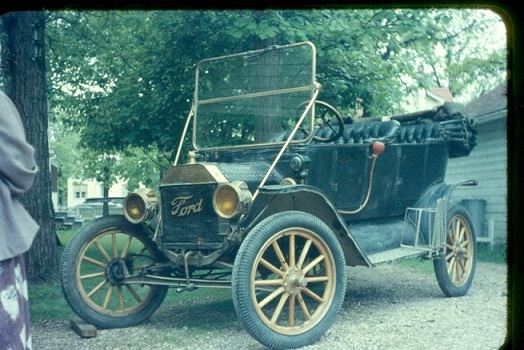 From communications with the Henry Ford indicate, there may be some information on vehicles from 1911, maybe your vehicle, and the dealers, Clymer. 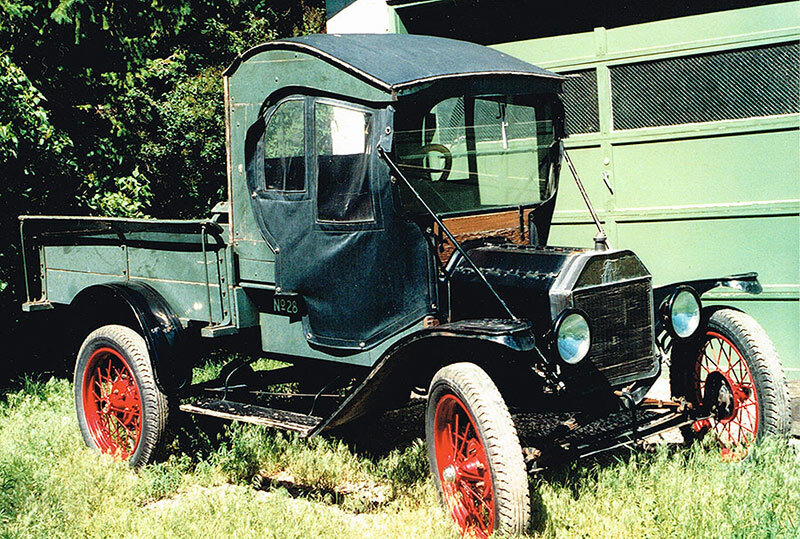 Our 23 touring was purchased used by my wife�s grandfather, Ludwig Erk, from a car dealership in Faith, SD in 1926. He bought it to take his eldest, Celine, to first grade in the school 3 miles from the ranch. They used the car well into the 40�s on the ranch. My father in law remembers putting orphan lambs from the high pastures in the back seat to take home and nurse. It sat in a sheep shed until the late 60�s when Uncle George took possession and fixed it up just enough to drive in 4th of July parades for 3 years. A blown head gasket put it back in the shed on wet straw under a tarp in the company of hoards of mice until we got it around 1998. It sat in my garage for at least 5 years until I got it running for a family reunion and gave Celine a ride in it. We�ve been driving it since then. 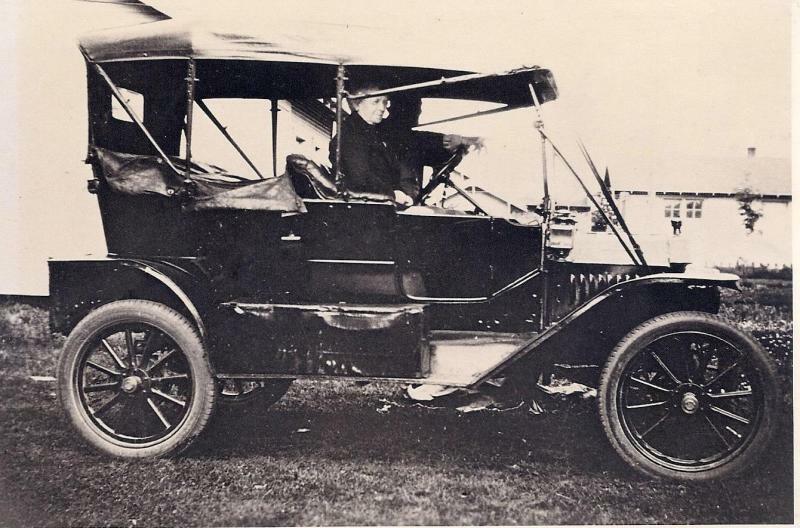 The front axle (1924 cast date) and spring (non-Ford) had been replaced as well as it has an un-numbered engine. Neither dad nor the uncles remember those replacements so I assume it was in an accident before Ludwig purchased it in 1926. The plugs were still in the rear tub, but the only top irons we found were non Ford. Nobody knows what happened to the top. The car has been from upstate NY to Canab and numerous points between since we�ve acquired it. 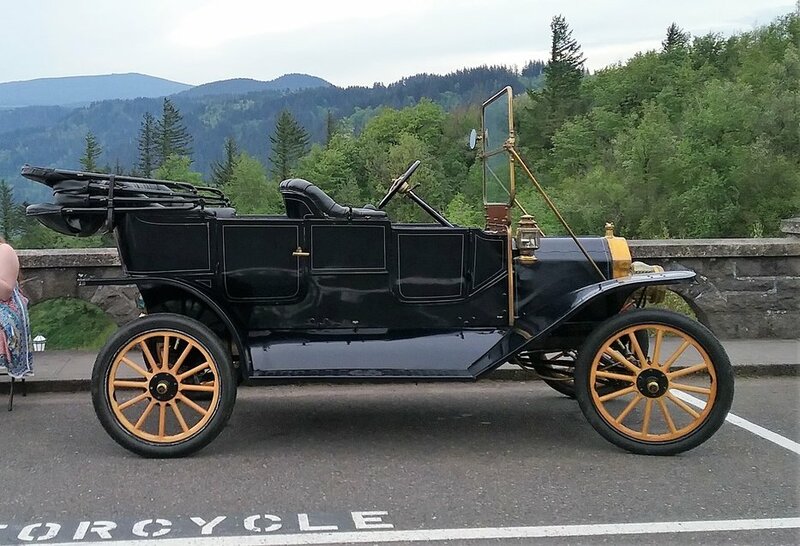 My Canadian 1912 touring was in the same family from new when I bought it this past spring. The past owner was 82 and bought new by his grandfather.It started live in Manitoba and then went on loan to the dealership then a museum in 1949. The original family retook possession of the car and moved it to Vancouver Island 8 years ago. Where it sat in storage in his garage and never driven until I bought it. My plan is to make it roadworthy and drive it. Our 18 Runabout was registered in Oconomowoc, WI (July of '17 body) for many, many years. It moved to Jefferson, WI in '73, then to New Ulm, MN where much work was done at likely both locations. A very short move in '83 for some 33 more waiting years. Since 2 thousand sixteen (not twenty-sixteen. ), he's provided great joy to me and Maw here in west central, MN. Here, he'll stay for awhile and what a joy to Toodle in! I have a tidbit of info on him and uber thankful for every scrap. My 1926 touring sat on my grandfathers farm property for 20+ years it originally belong to a Metis neighbour. I was working on the farm at age 14 and drove the John Deere past the "T" for years and referred to it as a piece of junk. When I came in to puberty the "T" started to look pretty good and it became an instant love affair. The car was mostly complete with no bullet holes and the original plate glass windshield and headlights were in tact, however it had no wheels and was sitting on the ground. The first owner I don't know, but the second owner was the METIS neighbour It was learned from my grandfather that John the Metis could not comprehend the operation of this complex machine. John was a horse and buggy man and was accustom to ordering the horses to stop by hollering whoa he tried the same procedure with the "T" and uncomfortably surprised when it would not stop. 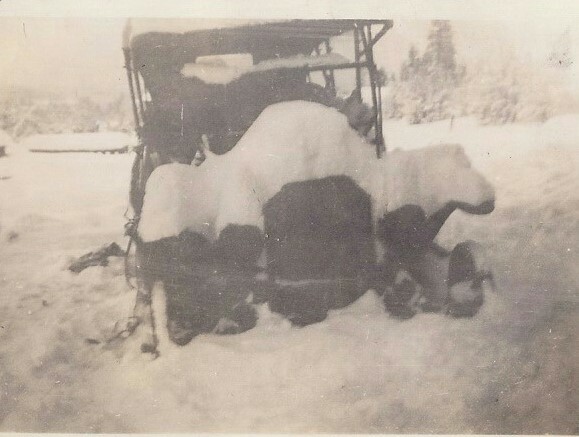 Because of his incapability to manage this complex machine he abandoned the car and took the wheels off and built a wagon for his horses to pull. After he had passed on I found the abandoned wagon with the "T" wheels they had solid rubber tires mounted on it I brought the car home in 1963 along with the solid rubber tires and removed all the spokes and re-sanded them and painted and the were as good as new. The were tapered spokes and could be re-assembled without a press. Some years later I was looking for top bows and was not having any luck as they were missing from the car. I suddenly had an idea that the Metis neighbour may have been fed up with a ratty top in his face and may have taken the top bows off in his front yard and just tossed them in the grass. About ten years after I acquired the car I made a special trip back to the farm where my theory had developed. With four people spread abreast we walked through the front yard looking for a bump in the ground, it wasn't 5 minutes into the search when a bump was felt in the earth and with a little kicking of earth the first top bow was discovered seconds later the second top bow was discovered. They were in the ground for 30+ years and could not be moved as they were very rusty. With some heat and TLC I got them fully working and they are on the car nearly 70 years hence. The car did not come with any top bow saddles just rubber plugs in the holes therefore I was confident that he could not lower the top to get it out of the way and with it being ratty and torn it was most likely in his face and the only option was to remove it. My hunch payed off. I have now owned the car since 1963 and I believe I am the third owner. I bought my �26 last February after years of persuading my Aunt Irene to sell it to me. My uncle died fifteen years ago and she was unwilling to part with any of his dearest possessions until ill health forced her to sell. She and Uncle Bill bought what was then �a pile of parts� from cousin Bessie. 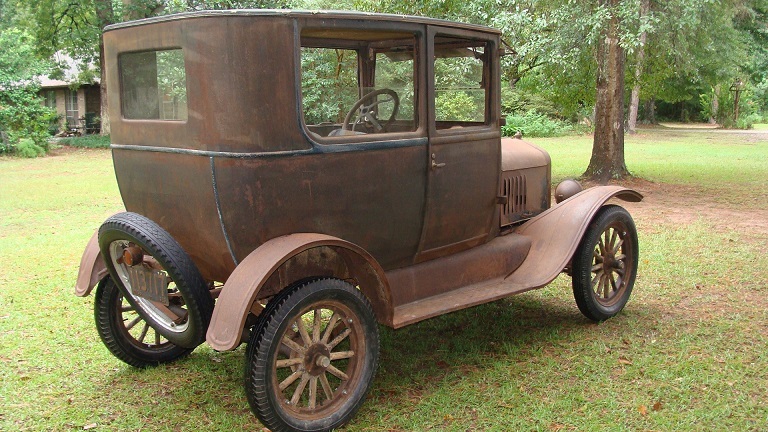 Bessie�s husband and son had started a restoration but never finished. Bessie got the car from her uncle Elmer who had used it as a farm truck. We don�t know who the original owner was but we know Uncle Elmer and Aunt Katie owned it as early as 1935. This is my Tilly today. This is Tilly in 1935. 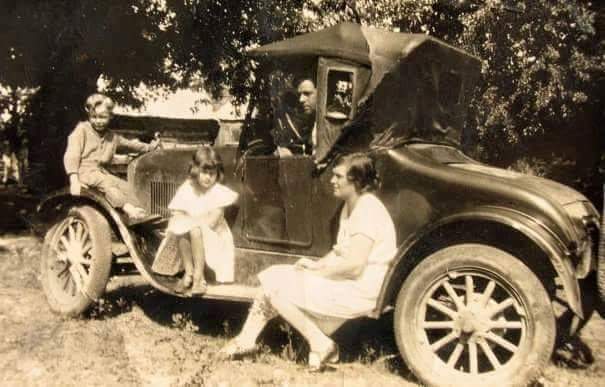 That is Elmer at the wheel and Katie, my grandmother�s sister, on the running board.